Photo from DC Pi(e) Day 2012 by Jen Mizgata. See more photos from Pi(e) Days past here. 3.14.13 is here! Today folks all across the world will be baking and eating pie, and memorizing its mathematical constant counterpart to the 50th decimal point, all in celebration of International Pi(e) Day, or more likely, an excuse to indulge in the flaky dessert. Here in DC, we'll be celebrating with a benefit for Common Good City Farm (find out more about them here) at The Dunes in Columbia Heights from 6-8:30pm. 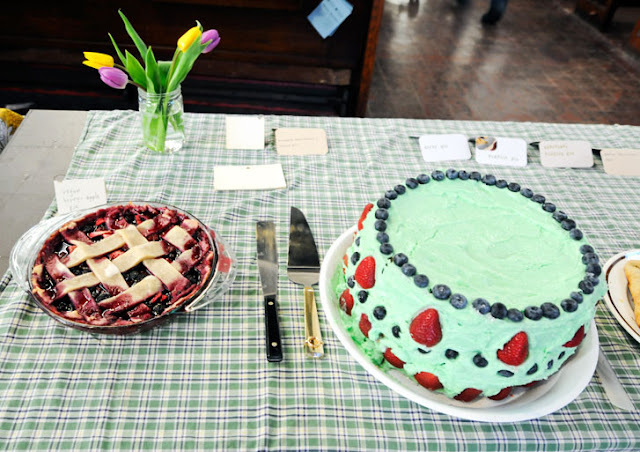 We'll have DJ Dianamatic on the ones and twos, a Pi(e) Walk where you can win a pie to bring home, a make-your-own pie watch craft and new Breakfast Issue by The Runcible Spoon, and oh yes, lots and lots of homemade sweet and savory pie! A $7 donation gets you in the door, and you can find more info here and here. If you're not in DC, you can check out some friends' pie parties in Durham, Harrisonburg, and Knoxville, or have your own impromptu pi(e) party tonight. Lora and I have some tips on how to do it in this issue of Zenchilada from a few years back. However you spend it, hope you get to enjoy some pie today.